Livestock is traditionally managed in mixed crop-livestock production systems in Sud-Kivu, D. R. Congo. Currently, livestock production is facing numerous constraints due to wars and insecurity in the country, with looting of animals, demographic pressure on natural resources, and lack of extension services. Multipurpose trees and shrubs with adequate forage quality could help overcome dry-season feed shortage. The objective of this research was to assess the agro-ecological adaptability of selected forage tree and shrub legumes combined with farmer participatory evaluation. The study was carried out at two distinct mid-altitude sites in Sud-Kivu. Trees and shrubs were planted randomly in eleven lines, with each species/accession consisting of nine plants split into three replications. Following a standardization cut after one year of growth, regular biomass harvests were performed every eight weeks during one year; Desmodium and Flemingia were cut at 0.5 m above soil surface, while Leucaena and Calliandra at 1 m. Before every harvest, plant height was measured and number of stems counted. Fresh leaf and stem biomass were weighted, sub samples dried and leaves analyzed for nutritive value. Results from agronomic evaluation show that Leucaena diversifolia ILRI 15551 and Leucaena leucocephala had the highest yield in the rainy season on fertile soil; during dry season, Leucaena diversifolia ILRI 15551 was superior. On poor soil, Flemingia macrophylla CIAT 17403 performed best in both seasons, however, its forage quality was relatively low. Forage tree and shrub legumes chosen by farmers were, in general, the same as those superior ones in agronomic evaluation. In the Kivu provinces of eastern Democratic Republic of Congo (DRC), livestock production faces numerous constraints. This has led to a strong decline of livestock due to high animal mortality, insufficient feed, social unrests resulting in livestock pillage  among others, within a context of demographic pressure on the natural resources, extreme poverty and alarming nutritional status of the population  . Livestock is traditionally managed within mixed crop-livestock production systems, where it performs various functions. Cattle are especially a sign of wealth and social status  , while they used to be a key element for maintaining soil fertility in the traditional mixed production system   . However, the cattle population has been dramatically reduced during the wars and unrest of the past decades  . Despite currently relatively low livestock populations in SudKivu, feed availability, especially during the dry season, is perceived by farmers as one of the major constraints  . Yet, forage cultivation to feed livestock is not practiced in Sud-Kivu   . In order to increase livestock productivity, forage cultivation could be a major component in the crop-livestock system, while benefitting additionally from their environmental functions, especially in sloped areas. Adapted multipurpose trees and shrubs with high forage quality can complement animal feeds, particularly during the dry season, when forage availability is low  . Through multi-site evaluations in tropical America, a number of suitable forage tree and shrub legume species and accessions have been identified, which are adapted to different agro-ecological conditions, especially tolerant to acidic soils  - . To address the above constraints, promoting forage cultivation could be one of the opportunities available to achieve sustainable animal-agriculture and, hence, improve farmers’ livelihoods. The objective of this study was to assess the agro-ecological adaptation of promising multi-purpose tree and shrub legumes in mid altitudes of Sud-Kivu combined with farmer participatory evaluation. Agronomic trials were performed at two mid-altitude sites in the “groupement” of Walungu, Sud-Kivu province; Kamanyola with relatively fertile soils and Tubimbi with low soil fertility (Table 1). The region is characterized by sub-humid climate with bimodal annual rainfall of about 1500 - 1800 mm  . Eleven forage tree and shrub legume accessions were tested: Desmodium velutinum (CIAT 13218, CIAT 23982 and CIAT 23996), Flemingia macrophylla (CIAT 17403 and CIAT 20618), Leucaena diversifolia (CIAT 17503, CIAT 22192, ILRI 15551, K780 and K782), and Leucaena leucocephala CIAT 17263, as well as locally available Calliandra calothyrsus as a check. Table 1 . Location and soil characteristics of two experimental sites in Sud-Kivu province, DRC. *ppm = parts per million, meq = milliequivalent, C.E.C. = Cation Exchange Capacity; Analyses by Crop Nutrition Laboratory and the World Agroforestry Centre (ICRAF), Nairobi, Kenya. sample per species/accession was analyzed by NIRS (near infrared reflectance spectroscopy) at the International Livestock Research Institute (ILRI) in Ethiopia. Combined mean fresh leaf and stem yield (MFLSY) was calculated in g/plant. MFLSY data was analyzed by season, i.e. harvests 1 in June, 2 in August and 5 in February were during dry seasons, while harvests 3 in October, 4 in December and 6 in April were during rainy seasons. Before every harvest, susceptibility to diseases and insect pests were observed on a scale from 1 (almost none to very little) to 5 (plant died), modified from  . The mean value of disease and pest susceptibility was obtained from the 6 cuts. Farmer participatory selection of forages was conducted in mid-April 2010 during the rainy season at both sites and in late August 2010 during the dry season at both sites with the local farmers involved in the trials, and organized in an association named “cavy and rabbit farmers”. Farmers were arranged in 2 groups according to gender, one team comprising 5 women and the other 5 men. In every location, one field replication was randomly chosen for the exercise. Every participating farmer had to select the three most preferred plots in terms of crop performance by dropping a white paper on the chosen plots. The number of papers per plot was counted and ranks were established. After choosing forages in the field, the two teams met to discuss in order to reach consensus between genders as recommended by  . Data are presented as ranks of preference by location. Data were statistically analyzed by computing descriptive statistics and performing analysis of variance (ANOVA) with GEN STAT for Teaching and STAVIEW version 5.0 software. Tukey’s range test was applied to establish significant differences (P ≤ 0.05) between treatments. Both agronomic and farmer participatory evaluation data were computed first by site and then across sites. Overall, plants were rather healthy, and disease and pest incidences were minor in both locations, ranging from 1 to 2 on a 1 - 5 scale (Table 2). While in Kamanyola, pest susceptibility was almost non-existent, in Tubimbi, especially Desmodium velutinum and Flemingia macrophylla accessions had moderate leaf damage. Regarding diseases, F. macrophylla accessions had moderate damage in both locations as well as D. velutinum CIAT 23996. There were significant differences (P ≤ 0.05) of plant height among the different accessions (Table 3). Overall, accessions of D. velutinum and F. macrophylla were much shorter than those of L. leucocephala, L. diversifolia and C. calothyrsus. On the other hand, the mean number of stems was significantly higher in the accessions of the former two species than of the latter three. Nevertheless, there appeared to be a differential effect of the sites on plant morphology. 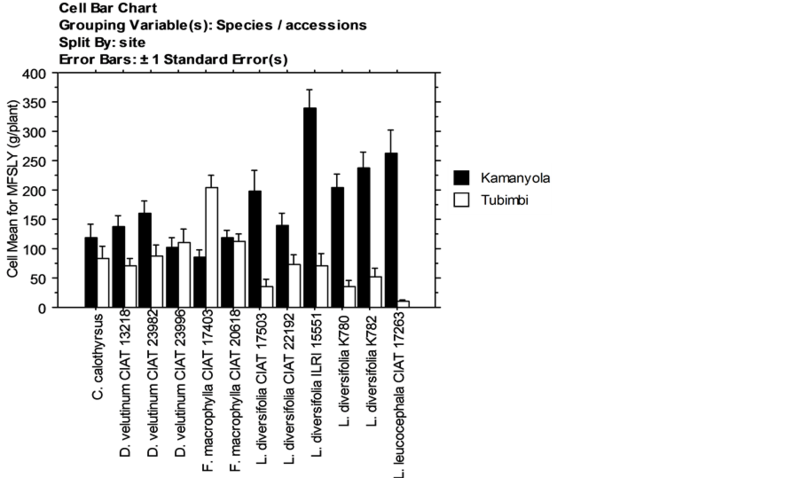 While plant height was similar in Kamanyola and Tubimbi in D. velutinum and F. macrophylla accessions, it was significantly higher in Leucaena accessions and Calliandra in Kamanyola when compared to Tubimbi. With the higher soil fertility of Kamanyola, also number of stems increased clearly in accessions of D. velutinum, Leucaena and Calliandra. Flemingia, on the other hand, produced even less number of stems in Kamanyola than in Tubimbi. Mean aboveground biomass production according to site and season is provided in Table4 There were significant differences between species and accessions. Also differential adaptation of the tested trees and shrubs to the two sites was found. In Kamanyola highest total biomass yields were achieved by Leucaena accessions except L. diversifolia CIAT 22192 in both rainy and dry seasons; whereas in Tubimbi, F. macrophylla CIAT 17403 attained highest mean biomass yields in both seasons. Especially during the dry season, FlemingiaTable2 Overall scales of disease and pest susceptibility for eleven forage tree and shrub legumes evaluated on a scale (1 - 5) during one year at two sites in Sud-Kivu. Table 3. Mean number of stems and mean height (cm) of forage tree and shrub legumes evaluated during one year at two sites in Sud-Kivu (±Stdv. ); different letters imply significant differences according to Tukey test (P ≤ 0.05). Desmodium and Calliandra accessions obtained similar or even higher biomass yields in Tubimbi when compared to Kamanyola, while Leucaena yields were very low. When comparing the overall mean biomass production of the species and accessions according to site, the differential adaptation becomes very clear (Figure 1). While Leucaena and some Desmodium accessions were significantly more productive on more fertile soil (Kamanyola), Flemingia CIAT 17403 and D. velutinum CIAT 23996 achieved superior biomass yields on infertile soil (Tubimbi). Figure 1. Mean leaf and stem biomass production (MFLSY) across six harvests of forage tree and shrub legumes evaluated during one year at two sites in SudKivu (in g/plant ± 1 Standard Error). Table 4. Mean seasonal aboveground biomass production (leaves and stems) of forage tree and shrub legumes evaluated during one year at two sites in Sud-Kivu (MFLSY (g/plant ± Stdv. ); different letters imply significant differences according to Tukey test (P ≤ 0.05). Nutritive values of forage trees and shrubs in both sites are given in Table5 Crude protein (CP) was from 18.6% to 27.0%, whereas organic matter digestibility (IVOMD) was in the range of 47.1% - 51%. In both sites, fiber (NDF) was most variable, F. macrophylla CIAT 17403 being very high with more than 60% in both Kamanyola and Tubimbi, while Leucaena was lowest (<40%). IVOMD of Leucaena was highest, especially L. leucocephala with more than 60%. F. macrophylla had the lowest digestibility within the range of 47.1% - 49.5%. Farmers’ choices of forage tree and shrub legumes are given according to site and season (Table 6). In Kamanyola, there was no clear preference for a species/accession except for L. diversifolia ILRI 15551 and L. leucocephala CIAT 17263 that were both ranked highly during rainy and dry season, while F. macrophylla CIAT 20618 occupied the fourth rank in both seasons. Similarly in Tubimbi, farmers’ choice varied according to season. Species/accessions preferred when emphasizing dry season were L. diversifolia K782, F. macrophylla CIAT 17403, L. diversifolia CIAT 22192 and D. velutinum CIAT 13218. Table 5 . Mean nutritive value of forage tree and shrub legume leaves across six biomass harvests during one year at two sites in Sud-Kivu (DM, dry matter; OM, organic matter; CP, Crude protein; NDF, neutral detergent fiber; IVOMD, in vitro organic matter digestibility). Table 6. Participatory ranking of forage tree and shrub legumes by female and male farmers in consensus according to site and season in Sud-Kivu (ranks in ascending order from 1 to 5). (Leucaena and Calliandra) grew significantly taller in Kamanyola than in Tubimbi. Regarding biomass production, however, it has to be considered that total biomass has been assessed in this study. This will substantially overestimate the biomass useful as forage due to higher stem mass at the more fertile site of Kamanyola because of the inherent higher weight of stems. Overall, plants were rather healthy and disease and pest impacts were negligible in the two sites as compared to Colombia  , even if Desmodium and Flemingia showed to be less susceptible than the other species/accessions evaluated. Leaves from legume trees and shrubs can be a valuable complement for feeding livestock, especially during the dry season when other feed stuffs are scarce or their nutritive quality is low. The nutritive value of several multipurpose trees and shrubs is relatively low   , depending highly on fiber content and on the presence and quantity of anti-nutritive components, such as condensed tannins or mimosine. High tannin levels result in low rumen protein degradability and low dry matter digestibility  . Some of the tree and shrub legumes tested in Sud-Kivu are suitable as forage for smallholder farmers due to their acceptable nutritive value. With its low number of stems, plant height, high yield and nutritional quality, C. calothyrsus is among the suitable forages, its nutritive value in terms of in vitro digestibility was higher in DRC than previously reported (24% - 47%)  . In Colombia, high levels of lysine were found in the amino acid profile of Leucaena diversifolia, but it was also high in tannins, thus, limiting amino acid digestibility. In a comparative assessment of nutritive value, lowest degradation (equivalent to digestibility for monogastric animals) was obtained for F. macrophylla, while that of D. velutinum and L. diversifolia was significantly higher, but still much lower than that of cowpea leaves  . In Tubimbi, CP of F. macrophylla CIAT 17403 was higher than 18.3% in Cameroon  ; however, fiber (NDF) was also high (57.4%) as observed by  in Colombia. High fiber content together with high tannins may result in low digestibility  . F. macrophylla is especially used to lower costs in smallholder production systems as a dry season supplement, sun shade and wind break, as well as for mulching and as living fence  . These multiple roles can make the species attractive, despite its relatively low forage quality. On the other hand, it may be worthwhile to further explore the potential of D. velutinum on acidic soils as this species has more favorable forage quality  . The results of the participatory evaluation show that farmers’ preferences agreed fairly well with the agronomic performance of the species/accessions evaluated. Farmer experimentation can successfully promote a technology and greatly increase acceptance and early adoption  . Its results can provide indications for agronomists, in addition to being a way to early involve farmers in possible innovations  . The agronomic evaluation at two agro-ecologically distinct sites in eastern DRC demonstrated that different forage trees and shrub species adapted differently. The species with higher forage quality, L. diversifolia (especially accession ILRI 15551) and L. leucocephala, performed superiorly at the site (Kamanyola) with higher soil fertility. While in Tubimbi with poor soil, F. macrophylla CIAT 17403 performed best. Especially during the dry season, Flemingia, Desmodium and Calliandra obtained similar or even higher biomass yields on poor soil (Tubimbi) than on more fertile one (Kamanyola). It is important to note that different accessions of the tested species showed quite some variations in performance and forage quality, indicating scope for selection. Farmers’ preferences concurred largely with the results from agronomic evaluation, indicating that farmers mostly appreciated biomass production. This may differ, if the feeding value of the tested species/accessions would also be evaluated. Farmers’ participatory evaluation results should provide good first indicators for agronomists, in addition to being a way to early involve farmers in an innovation process. The research was funded by the German Federal Ministry for Economic Cooperation and Development (BMZ) through the project “More Chicken and Pork in the Pot, and Money in Pocket: Improving Forages for Monogastric Animals with Low-income Farmers”, implemented by CIAT with the collaboration of INERA-Mulungu, DRC. A special thanks is given to the students T. Ngabo, F. Muhimuzi and S. Bacigale for helping to collect field data. The valuable input by farmers from Kamanyola and Tubimbi during participatory evaluation is gratefully acknowledged. Maass, B.L., Chiuri, W.L., Zozo, R., Katunga, M.M.D., Mètre, T.K. and Birachi, E. (2014) Using the “Livestock Ladder” as a Means for Poor Crop-Livestock Farmers to Exit Poverty in Sud-Kivu Province, Eastern D. R. Congo. Chapter 11. In: Vanlauwe, B., van Asten, P. and Blomme, G., Eds., Agro-Ecological Intensification of Agricultural Systems in the African Highlands, Earthscan, Routledge, London, 145-155. Katunga, M.M.D. (2013) Adaptation et évaluation des légumineuses fourragères dans un système d’élevage intégrantle lapin et le cobaye au Sud-Kivu, R. D. Congo. PhD. Thesis, Faculté de médecine vétérinaire Université de Lubumbashi, Lubumbashi, 212 p.
Kouonmenioc, J., Lacoste, A. and Guerin, H. (1991) Etude de l’influence de quatre fourrages ligneux sur l’évolution-pondérale des ovins de la race naine de l’Afrique de l'Ouest Station de recherches zootechniques de Nkolbisson. B.P. 1457, Yaoundé (Cameroun) Laboratoire de biologie végétale Université de Paris XI Centre d’Orsay (France) 3 Institut d'élevage et de médecine vétérinaire des pays tropicaux (IEMVT) 10, rue Pierre Curie, Maisons-Alfort (France).